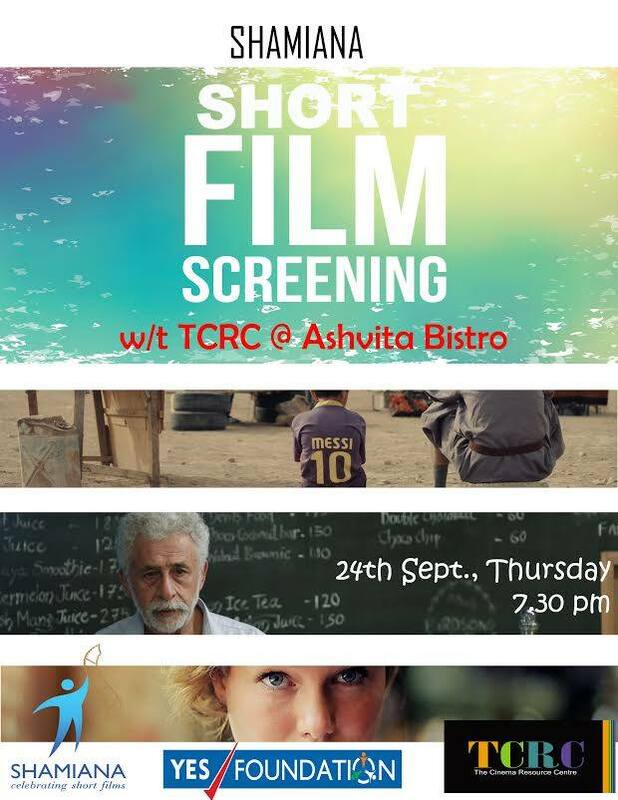 The next screening of short films by Indiearth in association with TCRC is happening at Ashvita Bistro,Chennai on the 28th of january 2015. 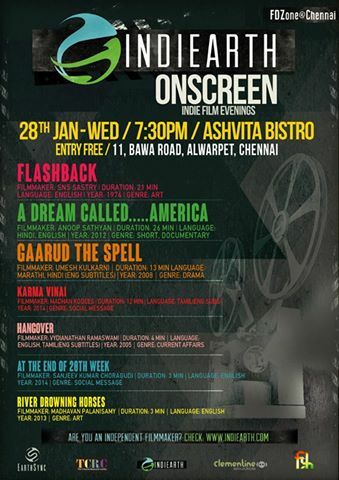 Post screening, we will have a discussion on various styles and techniques involved in short film making with the filmmakers – Madhavan Palanisamy, Arun Mritunjay, Sanjeev Kumar, Madhan Kodees and Vydianathan Ramaswami who would be attending the screening. SMS ” Short film ” with your name and email id to 9791088189. The film is a survey of the documentary film movement in India . We hear views of Films Division filmmakers S. Sukhdev and S N S Sastry before the Emergency and close to the end of their lives talking about documentary. The Spell gives us, in the form of a long tracking shot, a fascinating insight into what happens behind the doors of a block of tenements near the station in a small Indian town inhabited by people of differing backgrounds but all on the seamy side of life. Very briefly, we share their very personal lives. The camera takes us to the kitchens, the living rooms and even the toilets and the bedrooms of the inhabitants. The film won two national awards, one for best cinematography, and the other for best sound design. It received the best film award, the Golden Conch at MIFF, 2010.The film was also awarded the PATTON award for Best Indian Film at the 7th Kalpanirjhar International Short Fiction Film Festival, Kolkata.’Gaarud’ has been screened at more than 25 international film festivals, including the prestigious Rotterdam, and Vila de condo. ‘A Dream called America’ is a documentary made on Shahbaz, a 15 year old boy from Gujarat, India. He is the third among the five children of his father Aftab who makes a living by repairing cycles on a footpath. Shahbaz had studied in the US for a year on a scholarship, where he was hosted by an American couple. The one year he spent in US changed his attitude as he experienced a very comfortable and carefree life than his real home. After reaching India, he badly wants to go back and settle in US, leaving his parents in a dilemma. This short film deals with the flip side of college festivals in terms of excess inflow of sponsorship revenue leaving behind a trail of unwarranted usage of plastic and other environmentally hazardous waste. Two drunk friends meet a couple while passing through a bus stop at mid night. they drop them at bus stand, driver doesn’t care who are they as he was busy drinking while driving. when he sees both when they get down he gets disturbed. ‘At the End of 20th Week’ is a short film aimed at social awareness about Abortions and Female Infanticide. It portrays the pain of unborn female children. Our intention was not to get applauded or acclaimed by critics. Our intention was to take the veil of discrimination off the faces of people those who prefer sons over a daughters and who doesn’t accept life as a gift but choose to end it because it took a female form. A beautiful young girl who is peacefully enjoying the warmth and love from an unknown person gets tortured by also another unknown person in different ways. The girl cannot escape the wrath and stays there suffering. The bed which she assumed as a safe place suddenly turns into an Inferno. The person who shared the love and warmth is no more protecting her. She dies in the end and then we identify that it’s not just another girl but she is the representation of a female fetus. And all the different methods are nothing but methods of Abortion. In the end the young girl being pulled out of the bed symbolizes the delivery method of taking a baby out of the womb. She is killed and then we see the statement “Hell begins for women in India ‘At the End of 20th Week’” It is at the end of 20th week one can identify the gender of the foetus. In most of the cases it can be easily identified at the end of 13th week which on the other hand depends on the position of the fetus. Hence the title was decided as 20th week because irrespective of the position of foetus. This film blends elements of fashion and theatre to narrate a complex-relationship situation.